The Canadian Deaf Sports Association (CDSA) is honoured to receive a generous donation of $2,500 from Jim Kyte. His donation will be used towards Team Canada’s travel costs for the Winter Deaflympics to be held from December 12-21, 2019 in Italy. Jim Kyte, with a profound 100 decibels hearing loss, is the only Deaf player in the history of the NHL. 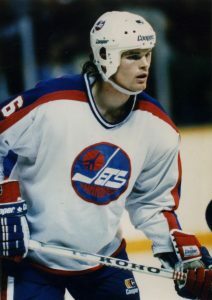 The 1st pick (12thoverall) of the Winnipeg Jets in the 1982 NHL draft went on to play 640 regular season and playoff games over 13 seasons with five NHL teams — Winnipeg, Pittsburgh, Calgary, Ottawa and San Jose. Jim Kyte with eight members of his family took part in the ice hockey tournament at the Canada Deaf Games in February 2018. Team Kyte won the tournament. Jim Kyte will be inducted into the Canadian Foundation for Physically Disabled Persons Hall of Fame on October 19th. Jim will be inducted along with former Canadian Prime Minister the Right Honourable Brian Mulroney and Alvin Law, a thalidomide survivor.